Sometimes you make something and just know that what you made is good, that it works. That’s what happened to me when I made Sue’s blocks. Her colour scheme was white, black and a bright colour of our choice. These blocks were a joy to create, they made me happy, they put a smile on my face when I looked at them. They belong together. I love them so much that my boyfriend asked me several times whether I wouldn’t regret mailing them off to someone I never even met in person. I do somewhat. Next to eachother on my design wall. What I love about these blocks is that they look modern and vibrant. I believe I managed to dose the bright colours enough to make them pop. I love these blocks even more when they are put next to each other as I think they truly are a set. 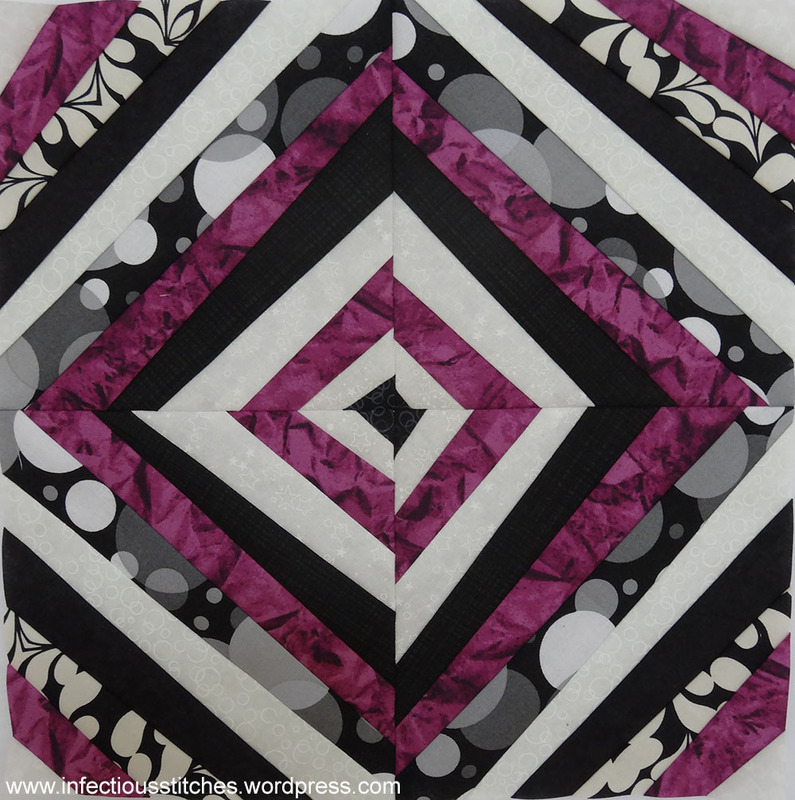 I started by picking three bright colours that I liked together and combined them with several white, black and white/black fabrics. 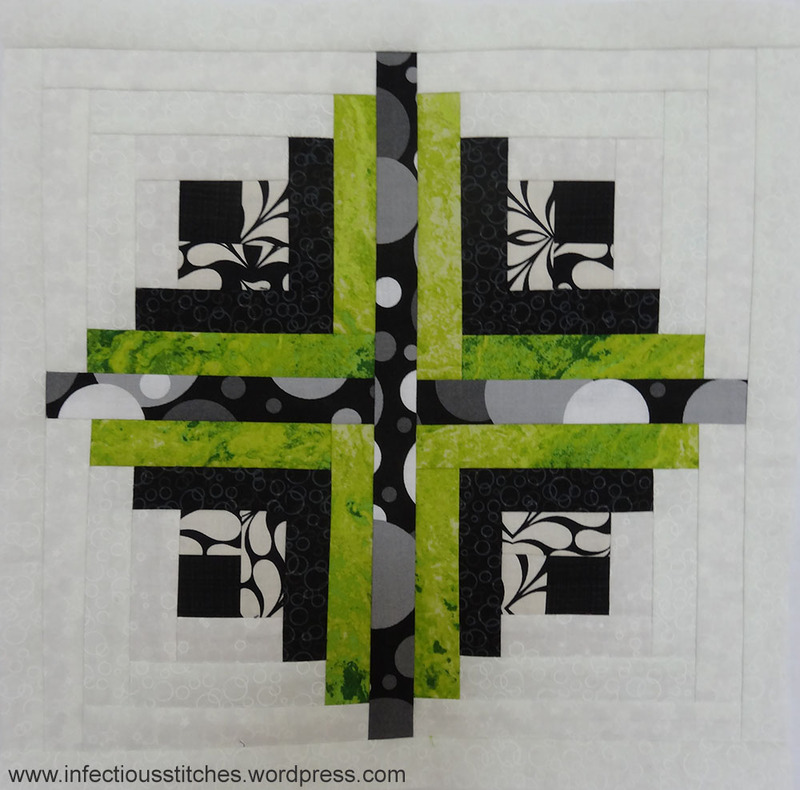 For my first block I was inspired by this string pincushion from V&Co and the fractured quilt from the book Quilting Modern by Katie Pedersen and Jacquie Gering, two quilters that I greatly admire. Katie mostly for her use of colour and Jacquie for her bold, well thought out designs. Fractured Quilt picture taken from “Quilting Modern” by Jacquie Gering and Katie Pedersen. To me the wonkiness in this block results in a suggestion of movement. 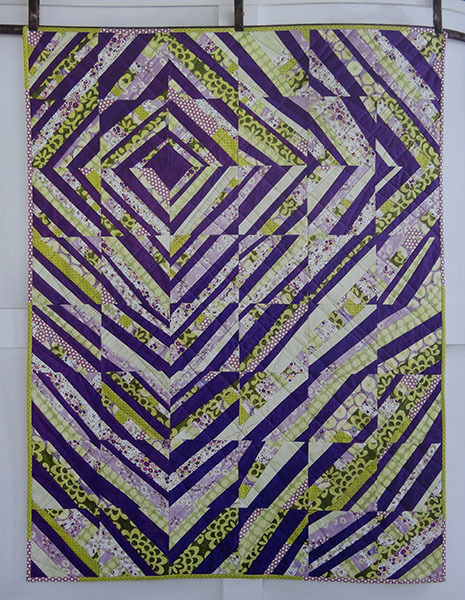 It was foundation paper pieced and I took pictures while I constructed it, so if anyone is interested I could do a quick tutorial. 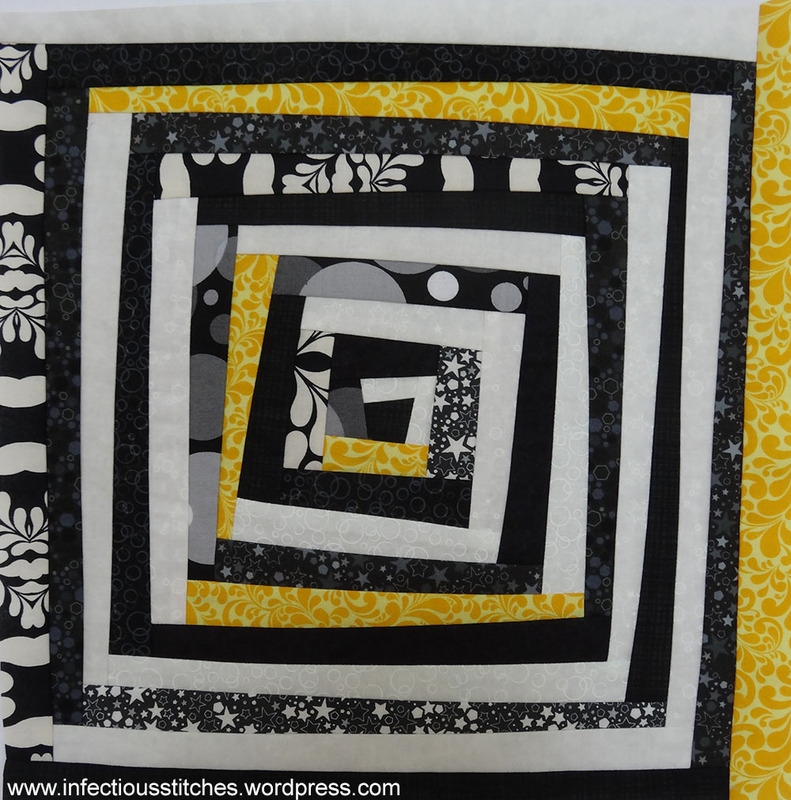 For my second block I was inspired by a mini quilt from the book Scrap Quilt Sensation by Katharine Guerrier, although I decided to not make my block wonky. 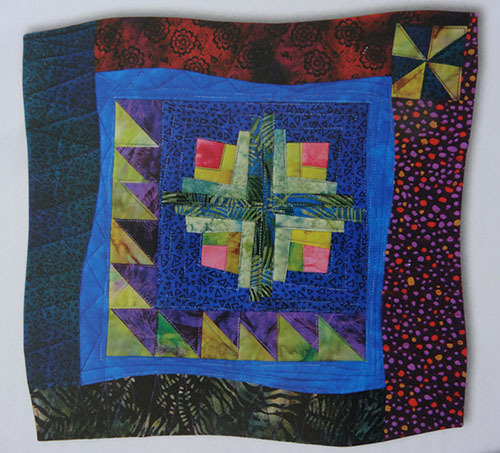 Picture taken from “Scrap Quilt Sensation” by Katharine Guerrier. I created four log cabins that were connected by a single cross and then sashed these in more white. The white (and some of the black) fabrics read like solids from a distance, but when you get closer you’ll see that they’re very subtle prints. For my third block I thought it would be nice to incorporate details from the other two blocks to create a coherent set. I used the narrow strips from both blocks, the wonkiness from the first block and the log cabin from the second block. The entire block is created as a wonky log cabin, but in such a way that you can follow either the black or white strips in a spiral from the centre to the outer edge of the block like a labyrinth or maze. One of the white/black fabrics was used as black and another one was used as white to create additional interest. The yellow fabric was also used as white. As always, the blocks created by the other participants can be viewed on the F2F page.